With the right accompaniments, roasted pumpkin can be the basis for an impressive appetizer. The New York Times provided a recipe that includes a balsamic vinaigrette, cheese crackers and watercress. Start by peeling 12 ounces of pumpkin, removing the seeds and cutting into half-inch cubes. Set the cubes on a baking sheet and toss in a mixture of sugar, salt, thyme, garlic and olive oil. Then, roast in an oven set to 375 degrees Fahrenheit for 15 minutes, or until the pieces are tender and lightly browned. While the pumpkin is in the oven, start on the crackers by placing four equal piles of Parmesan cheese on a non-stick cookie sheet. Once the pumpkin is finished, set it aside and bake the cheese. Closely supervise as the cheese melts and sets. Then, use a spatula to remove the crackers, place them on a plate and allow to cool. Make the dressing by combining olive oil, Parmesan basil and garlic in a blender and processing until smooth. Pour into a bowl and stir in white balsamic vinegar. In a large bowl, toss the dressing with three cups of watercress. 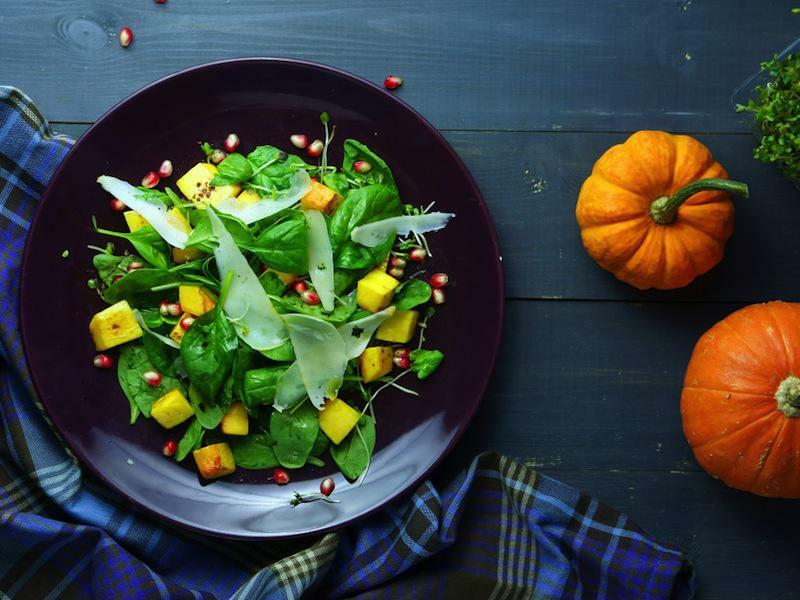 Move the leaves onto plates, topping with the pumpkin and garnishing with crackers. Make roasted pumpkin the start of an exceptional salad. A hot, satisfying soup is another great way of enjoying pumpkin flavor. Country Living offered simple directions that will ensure comforting results for a chilly autumn night. Melt two tablespoons of butter in a large pot on medium heat. Add pumpkin and onion, cooking for about eight minutes, or until the onion appears translucent. Pour in chicken broth and bring to a boil before covering and dropping the heat to low. After 10 to 12 minutes, check that the potato has become tender. Then, add canned pumpkin, using an immersion blender to puree until you have a smooth mixture. Mix in salt, pepper and nutmeg. Raise heat to medium-high, bringing the mixture to a boil. Then, cover and lower heat, cooking for 10 minutes. Add half a pint of heavy cream and season with salt and pepper to taste. Bring new life to an Italian favorite with the pumpkin calzone recipe from A Hedgehog in the Kitchen. Mix the leaven by combining flour, yeast, sugar and water. Let the mixture rest for 10 to 15 minutes, watching for it to become a bubbly brown dough. Place salt and flour in a mixer bowl, slowly combining. Keep mixing slowly as you pour in the leaven, followed by olive oil and then water. After about 10 minutes, you should have a smooth, springy dough. Cover and rest for an hour in a warm place as it doubles in size. Meanwhile, peel and seed a small pumpkin, cutting into halves. Add paprika and turmeric, followed by olive oil, salt and pepper. Roast in a 350-degree oven until the pumpkin softens. Boil pieces of broccoli in salted water for two minutes. Cook onion, chili pepper and thyme in olive oil on medium heat. Transfer the broccoli to the pan with the onion, and cook another five minutes. Divide the dough into balls and roll out. Fill the dough with ricotta cheese, salt, pepper, the vegetable mixture, mozzarella and pumpkin. Fold the dough, topping off with more cheese before placing in an oven set to 570 degrees for eight to 10 minutes.